In this next installment of our “What’s New in B2B Marketing Planning” blog series, we asked Chris Sietsema, a Digital Marketing Consultant and Owner of Teach To Fish Digital, to give us some insight into his experience with SEO and Marketing Analytics. Chris helps companies and organizations create, manage, and measure their own digital marketing campaigns. He specializes in website analytics, email marketing, SEO, search engine marketing, website usability, social media, online display advertising, content marketing, strategic marketing plan development, and more. Marissa Lavigna: Why is it beneficial to hire an expert vendor when working on your company’s website? First of all, there is a time savings. Of course, you want to be as efficient as possible. Second, people make judgment calls about a company, brand, and organization just by looking at their website. They get an immediate first impression, and first impressions are very important. And third, from a flow, usability, and messaging standpoint, sometimes doing work on your own site isn’t the best idea because you’re too close to it. It is beneficial to get an outside point of view, specifically from someone who knows the web and has an appreciation of how people access info online. You not only get insight from someone who does this all the time, but also someone with a fresh set of eyes. This can help refine your message and help it resonate. 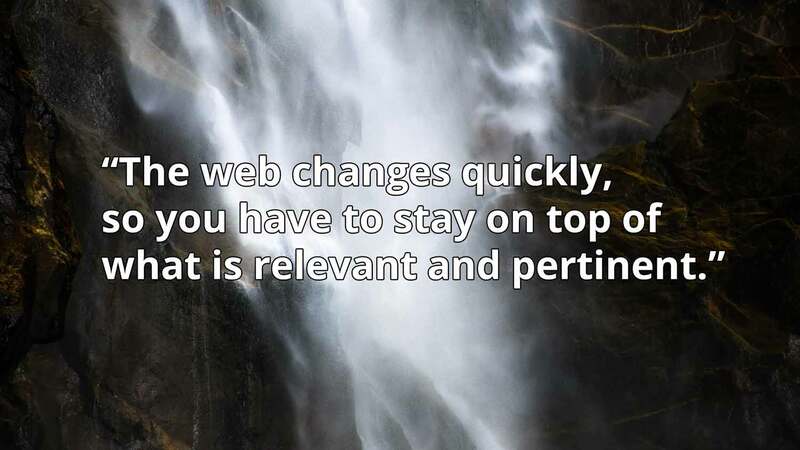 The web changes really quickly, so you have to stay on top of what is relevant and pertinent. There are so many different opportunities in terms of channels, marketing programs, and technology. It helps to bring on someone who knows what doesn’t work and what’s out of date with respect to aesthetics and effectiveness. Marissa: What are some of the services that an expert can provide for clients? Chris: Our goal is to make a complex situation really simple. We try to understand what is going on with a current website (or marketing program or online marketing campaign), diagnose issues, bring to light things that are extremely effective, and then make alterations as we go. In life, we have small, daily challenges and hurdles to get over, and we make adjustments every hour of the day. We approach marketing analytics and digital marketing in the same way. Little alterations can make a huge impact over time on a campaign, but you must be consistent and steady with the approach. Marissa: How should an expert work with clients and their websites in order to provide the most value to the client? Chris: My philosophy is that the secret sauce shouldn’t be a secret. I work with clients to understand what their marketing challenge or business objective is, and then we determine the best ways to tackle that challenge or achieve that objective. I start slow, looking at analytics, and keeping in mind what they are trying to achieve or overcome so I can make recommendations as to what they can do next. Sometimes the client will go on their way after receiving those recommendations, or sometimes they ask for more help with a problem we found during our review process. A vendor should diagnose the problem and then make a plan to fix things. The client should come away with the ability to make smart decisions on their next steps. Marissa: What special certifications should a vendor have before they are hired to perform analytics? Chris: For analytics, they should have a Google Analytics Certification. That can be accomplished by taking an online course and passing the test. You also want to look at any speaking credentials or publications the company (or key players in the company) have obtained, as well as client testimonials. Marissa: What metrics do you think are worthwhile to review or track? Chris: Metrics are a reflection of an individual client’s objectives or business goals. As far as industry standards and benchmarks, I steer clear of them. A benchmark should be whatever we did yesterday, last week, or last month and what number we were able to achieve on our own. You can always improve. If you are below the benchmark, don’t focus on that. People stress too much on what everyone else is doing. They should concentrate on their own tasks and objectives. Focus on what you can improve. Worry about what you can control. Marissa: Can you share what it means to first get a baseline and follow that with A/B testing, implementation, and then further testing? First, establish a baseline. Where are we on the map? Where are we in relation to our goal or destination? That could be “Increased Revenue” or “Improved Lead Volume” or “Higher Conversion Rates,” etc. Then you figure out how to get to the goal. For example, if you see a need to “Improve the Volume of Traffic,” you might start doing some advertising. If you see a need to improve qualitative metrics (like time on site, conversion rates, etc. ), it might be a source or content problem. So you might focus on better defining your target audiences and making content that appeals to them. Of course, there might be other things involved, like geographic location or spam referrals. You’re guaranteed to get to a point where situation X brings about Y result and you won’t understand why that result is happening. In those cases, you test. When there are no other good solutions (like those above), you create a little experiment to figure out what is going on. An A/B split test is an easy way to go as a first step. That means you change only one thing in X, and see if that change impacts the Y result. In other words, you establish a control case A and then change a variable in case B, and then compare the outcomes. If it proves conclusive, you apply the findings. If it proves inconclusive, you keep testing. Marissa: Is there anything else that you would like to cover? Chris: One other thing I would like to share is regarding reporting. Sometimes people get hyper-focused on what reports look like. They just focus on the charts or graphs or the number of slides in a PPT report. The MOST important part of any report given to a client is the insights. The translation of data, the diagnosis, and the “why” something is happening is paramount. Those insights, along with next steps, will provide guidance for the client’s decision making. This is an engine, a wheel that never stops turning. SEO and Marketing Analytics is an ongoing process that never stops – and can always improve. Want more insights about marketing analytics? Then check out our free SEO tip sheet. It includes more insights about how SEO and marketing analytics professionals think about imrpving websites.